cf. NDX post below for guidance. 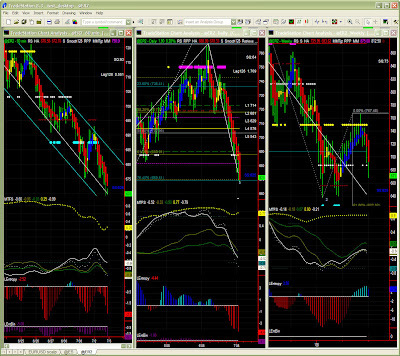 MM/Fib levels are however obviously symbol specific. Yesterday's forecast for ER2 was again accurate with a "uptick" early in the day as expected, then the fall resuming its course. About NDX, last post correctly warned on volatility in the short term (window dressing) and also anticipated a continuation of price erosion. NB: On account of the current market situation, FREE daily snapshots will be provided for another 2 weeks. 60mins: same volatile environment: congestion with lower bias. 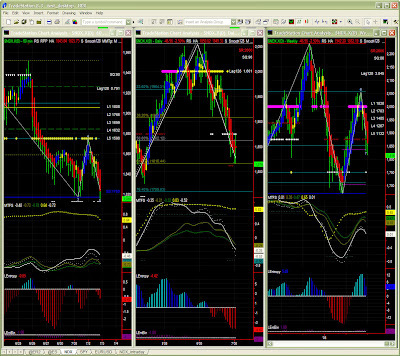 There is still evidently a lot of negative pressure in the market but a support could be found in current price area. Shorter time frames have higher significance levels and do point south however, so no unrealistic wishful thinking either as NDX could eventually fall to 1750. 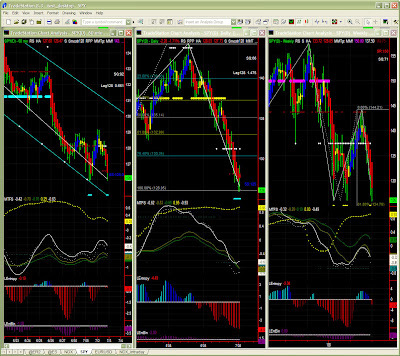 Significance level is good at this time frame, where indicators are still pretty bearish. Only price patterns give us a possible support around current lows (MM stall + Fib in the 1810s) so conservative short-sellers will look at possibly taking some profit soon. Again it seems the buyers are waiting for a support level to get back into the market (or are they on holiday already?). Bars have turned decidedly red, the Swing indicator toggled back to Down and Entropy has peaked. However MTFS despite showing a "failed recovery" pattern, is not quite indicative of a market fall just yet. We do acknowledge however that the last bars being very bearish indicate a likely lower support level although Fib L1 (~1838) may also only have been momentarily penetrated.